Meatballs are one of my favourite go to quick and easy dinners as they take hardly any preparation and can be ready in under 15 minutes. 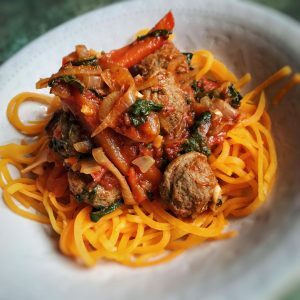 These meatballs in particular are delicious with my other favourite at the moment, 0sp Butternut Squash Noodles, or Boodles as Sainsbury’s like to call them. They made for a lovely filling dish but allow you to keep the smart points for the whole meal nice and low. You can serve with regular spaghetti if you prefer, just remember to add the points. If I have spaghetti with this dish I usually have 60g per person for a total of 12sp. Pop the spaghetti on to cook just after you have added the meatballs to the sauce. Take a large frying pan, spray with 1kal and add the onions, peppers and garlic frying on a medium heat for 5-6 minutes until the onions start to soften (add a little water if the pan starts getting a bit dry). Next add the paprika, oregano, crushed chillies and balsamic vinegar. Stir, fry for another minute and add the chopped tomatoes. Add a pinch of sugar, 100ml water and stir. Next add the meatballs into the sauce (raw), in one layer so that they are surrounded by the sauce. Leave to simmer for 5 minutes without touching. After five minutes, turn the meatballs so the uncooked side is submerged in the sauce. Leave to simmer for another 6-7 minutes until the meatballs are cooked through. Finally, season with salt and pepper, add the basil and spinach and let wilt and get ready to serve. I have these meatballs with butternut squash noodles. I buy them pre spiralised in Sainsbury’s and they just need 3 minutes in the microwave to cook. Pop half the pack in the bottom of a pasta bowl, top with the tomatoey meatball sauce and finish with 10g grated parmesan per person.